Want to open a new small business online as a food seller or a different business as a food broker? How about a book packager or distributor? Want to open a new small business as a food broker? Big food retailers usually don't buy from small food businesses. Instead, the big food companies such as supermarkets buy from sales brokers. What the sales broker does is negotiate sales for some small business's product, such as a nutritional candy bar, special dessert, healthier food product, or other food item usually sold in supermarkets and various food markets or even schools. Small businesses that sell food items often don't have a high sales volume when they're first trying to get their product(s) into stores. What the sales brokers do in the food arena is to negotiate sale deals with a retailer's distributor. In turn, it's the food retailer's distributor who keeps enough supply of a small business's new food product. As compensation, a food broker will take about 5 percent of the retail price of the food product. It works something like a writer who sends his/her manuscript to an agent instead of directly to a major paperback publisher. What happens in the food broker business, though, is that big supermarkets and discount stores order the small business owner's food product through their own distributors. Then, the distributors take another 25 to 40 percent of the price. So it seems as if everyone is taking a chunk of commission out of the price of the small business's retail price of the food product, whether it's a candy bar, healthier or nutrient-packed food item, or a jar of specialty food. Now, the small business making the food product delivers the specialty item to a food distributor. Then the food distributor, in turn, delivers or 'ships' the food item to the big food retailer. The big food retailer takes around a 40 percent chunk out of the small business owner's food items as they sell to the public. The goal for the big food seller is efficiency and profit for someone's food product. Retailers like the convenience of ordering their foods from one distributor instead of having to deal with many different small businesses making different types of food products. With all those different brands on the market, large food retailing businesses such as supermarkets prefer to deal with one distributor. That's why it's important if you have a food product that you want to sell, whether it's a candy bar, jar of sauce, nutrition product, or any other food item you want to retail, you'd need to price your item to be affordable to the customers who can afford your product. Maybe you have organic food that's certified and inspected and you only want to sell to organic food stores or supermarkets that have food aisles dedicated to stacks of organic foods. Or maybe you're selling vegan products, items with no salt, no fats or oils, no sugar, no preservatives, foods for special diets, ethnic foods, or foods marked non-GMO, such as tortillas, crackers, or breads made from sprouted grains instead of flour, or chips baked without added fats or added salt. Are you trying to reach the average consumer? Or people with specific diet restrictions? Is your product for certain age groups? Or are you making gift items such as fruit baskets? On one hand, you have the small business owner producing the specialty food. On the other side is the food broker who deals with foods of thousands of different brands that go to various supermarkets and specialty food markets. Which are you more interested in --being the food broker or being the small business owner who produces a specific food product that you'd like to be displayed in supermarkets? You have the health-conscious customers and others looking for specialty foods such as ethnic foods in packages or jars. Your goal would be to find markets where people are most likely to buy what you have to sell if you're making the food product. The problem with being the small business making a specialty food item is that many run out of funding. And if you price your food too high, the average customer will not be able to afford the product. Numerous small businesses making specialty food items wish they wouldn't have to dill with food brokers or distributors because each takes a cut of the small business's profit, the person who designed/invented/packaged the food item. Then there are business consultants that some small businesses go to for counseling on how to research markets of what customers want and also how to check out various markets that don't require a small business to use distributors. sensitivities, for example, gluten-free items. It's about researching what specific needs are for people who want specialty foods for their diets or to avoid various food allergens tailored to individual customer needs, if there's enough of a market. If you sell your product online, for example, directly to consumers, you then have to be able to afford to pay the farmers who sell you their products in whatever area of the world from which you get your basic food products needed to make your specialty food item. People aren't looking for something with a label of "health food" on it as much as individuals want to refer to such specialty foods as tailored to health-conscious customers. The goal is not to put in 'cheap' products into what you're selling. Instead, your pricing would have to be enough to attract customers willing to pay the price you put on your item. Some food businesses working on a smaller scale need to produce the food item at a third of the cost of what the item retails for when a customer buys that item at a food store. Customers buy specialty items often because they don't want to buy from producers known to cut corners to save money, if the customer is willing to pay for a specific item at a fair price that the customer can afford. Selling a product is about you trying to make money and the customer trying to save money, a push-and-pull arena, of opposite goals, much like the romantic tension of separation followed by the harmony of bonding of togetherness that's found in many romance novels. When you open a business of any type or size that sells directly to customers without going through a distributor, you're dealing with offering customers alternatives, such as more choices. The average customer already knows what's on the market in the big stores. Maybe you're selling something that the customer or you as the business owner already has researched. That's why market research is very important before you even start to make and sell something. You need to make your product accessible, affordable, and available. First you find a need -- what the customers want in a product you want to produce, grow, or package. Then you need to do market research to find out whether you can afford to produce the product and how many customers would be interested in what you have to offer. It works the same with writers trying to sell self-published paperback books. A lot of writers want to avoid the cost of a distributor for the published books. Business is about matchmaking. For the small business owner and even for the broker and distributor, it's about researching what the market will bear, share, care, and repair. 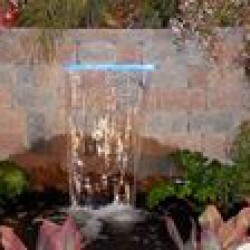 And that end product helps increase alternatives-- more choices for customers. Here's how to make money or a career out of selling facts to hidden and famous markets, nontraditional markets, and individuals in search of novelty, cutting edge facts, or historical facts come full circle. 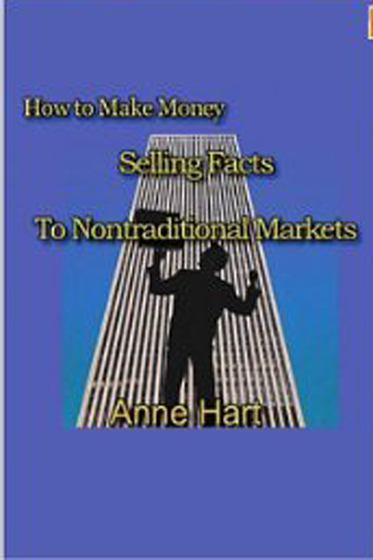 How to make money selling information to nontraditional markets, by Anne Hart, is about offering facts as a front-loading ancillary and a resource for gathering and offering information and resources. Facts you can sell can be uncommon news, results of research, indexing publications, finding trivia details, research and findings on recruiting people for medical trials done by pharmaceutical companies to facts on ancient military strategies for historians and fiction authors or facts on success stories and corporate histories, biographies, and news on inside information, interviews, and trends. You can find facts that are important to a few niche markets or to think tanks seeking trends in behavior or technology, and you can sell the facts to trade journals, professional associations, corporations, or institutes. You don't have to be an expert to find facts, just gather and glean the newest or oldest facts from experts from different sides. Separate the facts from the opinions and sell the facts.